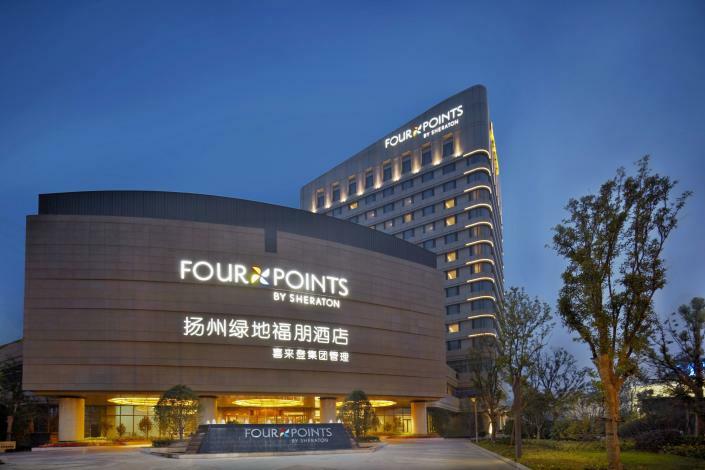 The Four Points by Sheraton Yangzhou (Yangzhou Lvdi Fupeng Jiudian) is a 5-star hotel situated on the northern bank of the Yangtze River, about 6.4 km (4 mi) from the Yangzhou Railway Station and a 100-minute drive from the Nanjing Lukou International Airport.This Yangzhou deluxe hotel offers rooms and suites with distinct Sheraton Four Comfort Beds. Other room amenities include flat screen LCD TVs, wireless Internet access, safes, mini-bars and refrigerators. In terms of dining, you may enjoy a variety of Chinese cuisines at China Spice or Japanese dishes at the Japanese restaurant. Additionally, the Eatery serves Western cuisine if you can't spy your favorite Chinese dishes.To plan events like weddings, parties, trainings or conferences, you should make full use of the function rooms as well as the business center on the premises, which will ensure a smooth event.To unwind, you can take a swim in the heated indoor pool, exercise your body in the fitness center, or relax in the spa.